Biologist Logan Maxwell recently completed her master’s work at UNH. 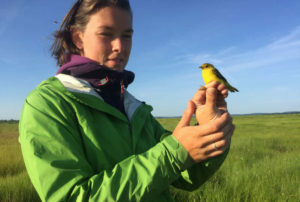 Her research focused on ways climate change affects birds along our coast. 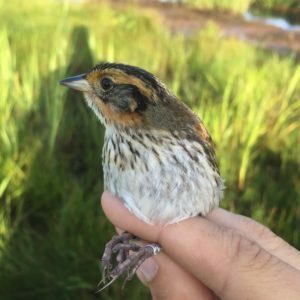 Our saltmarshes provide breeding habitat for a community of uniquely adapted birds that are threatened by the ongoing changes in vegetation, loss of habitat, and increased tidal flooding due to rising sea levels. Logan’s aim was to figure out how saltmarsh birds might adapt to this changing environment. Birds that live in our saltmarshes are seriously impacted by lunar high tides. These tides are the leading cause of nest failure. Saltmarsh nesting birds are extremely vulnerable to even slight increases in sea level. How might they survive? Logan is an engaging speaker who relates well to a diverse audience. You will leave this program with a better understanding of factors which concern the birder, motivate the biologist, and threaten our saltmarsh birds. This program is free and open to the public. Come early for refreshments and social time. The program will be at 7 p.m. in the Mather Auditorium at the Wells Reserve at Laudholm. Free and open to the public. Come early for social time and refreshments.